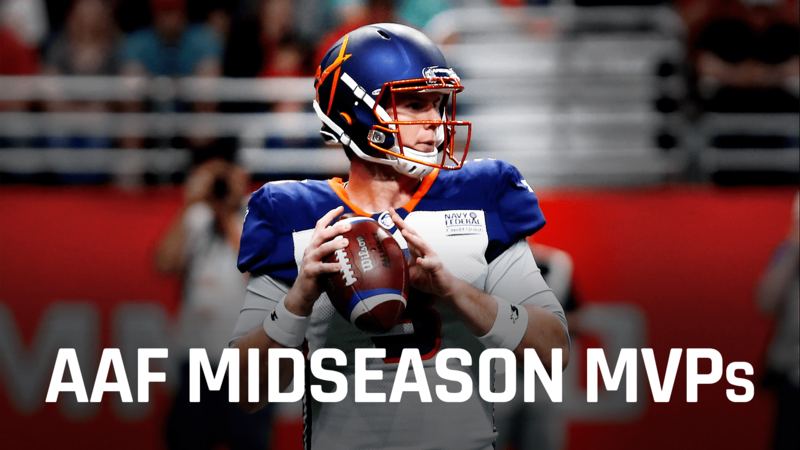 The Alliance of American Football is halfway through its inaugural season, so we thought it’d be a good idea to look at the best players in the league so far. We’ll break it down by looking at the three most important facets of the game: offense, defense and special teams. Our list goes five players for offense and defense with three special teamers. Most of the players on this list should get a look from NFL teams once the AAF season comes to a close. This is an obvious choice. He’s been the clear league MVP since Week 1 as he leads the undefeated Apollos with his 271 pass yards per game (which leads the league). He’s been impressive all around, completing 62.8 percent of his passes with 9.2 yards per attempt, eight passing touchdowns and zero interceptions. Oh, and he’s rushed and caught a touchdown as well. Gilbert turned down a futures contract in the NFL to prove he was worth more in the AAF, and it’s paid off for him. If he keeps up this production he’ll definitely be the offensive MVP by season’s end. Gilbert’s been blessed by having Johnson as a weapon to throw to. He leads the league in receptions (29) and receiving yards (493) by being a reliable option every week. He’s had 50 or more receiving yards in every game this season and is a big reason why Orlando’s offense has been so successful. Johnson and Gilbert mutually benefit from having one another, and it’s clear whenever they take the field. Ross has been a bright spot on an otherwise struggling Arizona Hotshots team. He has at least four receptions, 50 yards and a touchdown in the first five games this season. That’s remarkable consistency, especially when QB John Wolford has struggled and also missed some time with an injury. Ross spent time on eight different NFL teams throughout his career, but he was always fighting for a roster spot. Perhaps his dominance in the AAF can make teams take his talents a little more seriously. I know, we limited the offensive players to just five and there are three Apollos players on this list. But they’ve been that good. D’Ernest Johnson has been extremely effective running 43 times for 251 yards (5.8 ypc) while catching 10 passes for 128 yards. He’s PFF’s top-rated running back through five weeks (77.7 grade) because he makes magic happen every time he touches the ball. His fellow backfield mate De’Veon Smith is also worth a mention as he’s had similar numbers in the running game. Richardson certainly hasn’t been the most effective running back with his 2.4 yards per carry, but it’s impossible to ignore his contributions in the red zone. He’s scored eight of the Iron’s nine offensive touchdowns and even though his average is low, his 75 carries have helped the Iron manage games and come out with victories early in the season. And lately, Birmingham has used him as a receiver, which has actually worked out better. He’s caught 19 passes for 142 yards, which are both league highs for running backs. I’m not sure if an NFL team will give him a look, but he’s been productive enough to make this list. Reaser has been incredible in coverage, earning PFF’s highest player grade in the league with a 95.2 overall rating. Quarterbacks throwing in his direction have a 7.6 passer rating. He’s allowed just eight receptions on 22 targets for 78 yards while recording three interceptions and nine pass deflections. Reaser was a 5th-round pick in 2014 and couldn’t stay on the 49ers’ or Chiefs’ roster. But with this type of production, he’s had to catch the eye of at least a few NFL teams. Summers has been the face of the Iron’s tough defense as he’s been shutting down defenders most weeks. He’s earned a 77.8 grade from PFF through five weeks, third-best for defensive backs. He struggled a bit against Charles Johnson in Week 5, but QBs had a 2.8 passer rating when thrown in his direction heading into that game. Expect him to bounce back from that performance and get right where he was at the start of the year. Moore was a third-round pick by the Giants whose NFL dream was cut short due to off-field issues. He’s certainly proved he still has the talent as he’s piled up four sacks, 15 QB hits and 27 pressures in four games (he missed one game due to injury) for the Fleet. And for good measure, he has two pass deflections and a forced fumble to pad his stats. He’s earned a 92.0 grade from PFF, the highest out of all edge defenders in the league. Schult’s been a force for Salt Lake defensively, piling up 18 total tackles with 10 tackles for loss, five sacks (leads the league) and 14 QB hits. He also leads all pass rushers with 33 quarterback pressures. There hasn’t been too much excitement for Stallions fans this season, but Schult has been exciting to watch each week. He has a sack in every game but one, and the only game he didn’t record a sack, he had a season-high four QB hits. Smith hasn’t been one of the flashier players in the league so far, but he’s played extremely well. He had two interceptions get called back due to penalties from teammates in Week 5, but he did finish with a 66-yard interception return touchdown still. He leads all safeties with a 93.9 grade from PFF as he’s made life extremely difficult for opposing offenses. He’s better in coverage than in run defense, but overall he’s been a huge help for the Commanders’ defense. When your offense is struggling, it’s crucial to have a good punter and luckily the Iron have the best in the league. Schmidt is averaging 45 yards per punt and has continuously placed punts inside the 20-yard line. He won special teams player of the week in Week 3 after dropping five punts inside the 20 in a single game. He deserves a look from someone in the NFL who needs a good punter. Koo couldn’t quite stay in the NFL, but he’s been incredible in the AAF. He’s been 11-of-11 on field goal kicks this season and has made back-to-back game winners for the Legends. Atlanta is averaging the fewest amount of points on offense in the league, so having a reliable kicker has been crucial in their two wins. Kick returns don’t exist in the AAF, but punt returns do and Brooks owns the only punt return touchdown in league history. Brooks is a cool story because at 30, he’s one of the older players in the league. He’s been solid on defense, but his contributions to the return game landed him on this list. His touchdown is the highlight, but he’s made other big returns as well.